What Day Of The Week Is August 16? 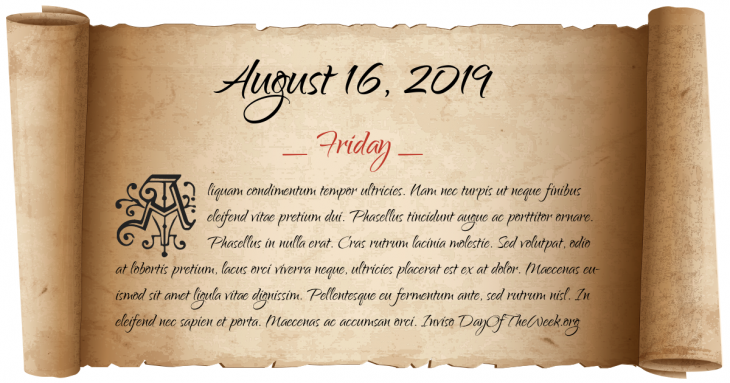 August 16, 2019 is the 228th day of the year 2019 in the Gregorian calendar. There are 137 days remaining until the end of the year. The day of the week is Friday. American Revolutionary War: The Americans led by General John Stark rout British and Brunswick troops under Friedrich Baum at the Battle of Bennington in Walloomsac, New York. French Revolution: a levée en masse is decreed by the National Convention. U.S. President James Buchanan inaugurates the new transatlantic telegraph cable by exchanging greetings with Queen Victoria of the United Kingdom. However, a weak signal forces a shutdown of the service in a few weeks. Battle of Acosta Ñu: A Paraguayan battalion made up of children is massacred by the Brazilian Army during the War of the Triple Alliance. Franco-Prussian War: The Battle of Mars-La-Tour is fought, resulting in a Prussian victory. The Basilica of San Sebastian in Manila, the first all-steel church in Asia, is officially inaugurated and blessed. An estimated 8.2 MW earthquake hits Valparaíso, Chile, killing 3,886 people. Ray Chapman of the Cleveland Indians is hit on the head by a fastball thrown by Carl Mays of the New York Yankees, and dies early the next day. Chapman was the second player to die from injuries sustained in a Major League Baseball game, the first being Doc Powers in 1909. Joseph Kittinger parachutes from a balloon over New Mexico at 102800 ft, setting three records that still stand today: High-altitude jump, free-fall, and highest speed by a human without an aircraft. Eight years after the remaining French India territories were handed to India, the ratifications of the treaty are exchanged to make the transfer official. Who were born on August 16?